The term Torah Crown refers not only to the artful decoration placed on top of the Torah scrolls in synagogues, but also to the Jewish ideal of lifelong learning. The Torah, the five books of Moses, forms the centerpiece of Jewish scholarship. 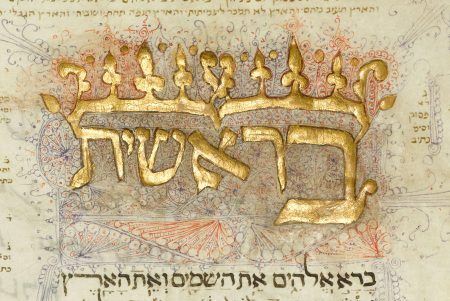 The importance and adoration of the Torah is reflected in the illumination of the opening word Bereshit, adorned with two crowns. Executed on fine parchment and with delicate ornamentation, the result is a splendid manuscript in which even the critical notes decorate the main text with a micrographic pattern.